ZENO of Elea, son of Teleutagoras, was born early in the fifth century B.C. He was the pupil of Parmenides, and his relations with him were so intimate that Plato calls him Parmenides's son (Soph. 241 D). Strabo (vi. 1, 1) applies to him as well as to his master the name Pythagorean, and gives him the credit of advancing the cause of law and order in Elea. Several writers say that he taught in Athens for a while. There are numerous accounts of his capture as party to a conspiracy; these accounts differ widely from each other, and the only point of agreement between them has reference to his determination in shielding his fellow conspirators. We find reference to one book which he wrote in prose (Plato, Parm. 127 C), each section of which showed the absurdity of some element in the popular belief. Literature: Lohse, Halis 1794; Gerling, de Zenonis Paralogismis, Marburg 1825; Wellmann, Zenos Beweise, G.-Pr. Frkf. a. O. 1870; Raab, d. Zenonische Beweise, Schweinf. 1880; Schneider, Philol. xxxv. 1876; Tannery, Rev. Philos. Oct. 1885; Dunan, Les arguments de Zenon, Paris 1884; Brochard, Les arguments de Zenon, Paris 1888; Frontera, Etude sur les arguments de Zenon, Paris 1891. INCLUDING THE TRANSLATION OF THE FRAGMENTS. many and infinite things, since there is always something before that which is apprehended, by reason of its infinite divisibility; and this he proves by first showing that nothing has any greatness because each thing of the many is identical with itself and is one. 1. Cf. Arist. Metaph. ii. 4; 1001 b 8. Ibid. 236 v. Zeno's argument that when anything is in a space equal to itself, it is either in motion or at rest, and that nothing is moved in the present moment, and that the moving body is always in a space equal to itself at each present moment, may, I think, be put in a syllogism as follows: The arrow which is moving forward is at every present moment in a space equal to itself, accordingly in <a space equal to itself> it is in a space equal to itself in all time; but that which is in a space equal to itself in the present moment is not in motion. Accordingly it is in a state of rest, since it is not moved in the present moment, and that which is not moving is at rest, since everything is either in motion or at rest. So the arrow which is moving forward is at rest while it is moving forward, in every moment of its motion. 237 r. The Achilles argument is so named because Achilles is named in it as the example, and the argument shows that if he pursued a tortoise it would be impossible for him to overtake it. 1. Arist. Phys. vii. 5, 250, 20.
ten-thousandth part of a grain? On receiving the answer that it does not, he went on: Does a measure of millet grains make a noise when it falls, or not? He answered, it does make a noise. Well, said Zeno, does not the statement about the measure of millet apply to the one grain and the ten-thousandth part of a grain? He assented, and Zeno continued, Are not the statements as to the noise the same in regard to each? For as are the things that make a noise, so are the noises. Since this is the case, if the measure of millet makes a noise, the one grain and the ten-thousandth part of a grain make a noise. (b) ZENO'S ARGUMENTS AS DESCRIBED BY ARISTOTLE. Phys. iv. 1; 209 a 23. Zeno's problem demands some consideration; if all being is in some place, evidently there must be a place of this place, and so on indefinitely. 3; 210 b 22. It is not difficult to solve Zeno's problem, that if place is anything, it will be in some place; there is no reason why the first place should not be in something else, not however as in that place, but just as health exists in warm beings as a state while warmth exists in matter as a property of it. So it is not necessary to assume an indefinite series of places. reached by division, for time itself is infinite from this standpoint. So the result is that it traverses the infinite in an infinite, not a finite time, and that infinites, not finites, come in contact with infinites. the middle; in which case he thinks half the time equal to twice the time. The fallacy lies in the fact that while he postulates that bodies of equal size move forward with equal speed for an equal time, he compares the one with something in motion, the other with something at rest. (c) PASSAGES RELATING TO ZENO IN THE DOXOGRAPHISTS. Plut. Strom. 6; Dox. 581. Zeno the Eleatic brought out nothing peculiar to himself, but he started farther difficulties about these things. Epiph. adv. Haer. iii. 11; Dox. 590. Zeno the Eleatic, a dialectician equal to the other Zeno, says that the earth does not move, and that no space is void of content. He speaks as follows:—That which is moved is moved in the place in which it is, or in the place in which it is not; it is neither moved in the place in which it is, nor in the place in which it is not; accordingly it is not moved at all. Galen, Hist. Phil. 3; Dox. 601. Zeno the Eleatic is said to have introduced the dialectic philosophy. 7; Dox. 604. He was a skeptic. Aet. i. 7; Dox. 303. Melissos and Zeno say that the one is universal, and that it exists alone, eternal, and unlimited. And this one is necessity [Heeren inserts here the name Empedokles], and the material of it is the four elements, and the forms are strife and love. He says that the elements are gods, and the mixture of them is the world. The uniform will be resolved into them;1 he thinks that souls are divine, and that pure men who share these things in a pure way are divine. 23; 320. Zeno et al. denied generation and destruction, because they thought that the all is unmoved. 1. Reading πρὸς ταυτα λυθήσεται, which, as Mr. G. D. Lord suggests to me, is probably the source of the corruption προστανλυθήσεται. The Vatican vulgate combines both readings. Simp. Phys. 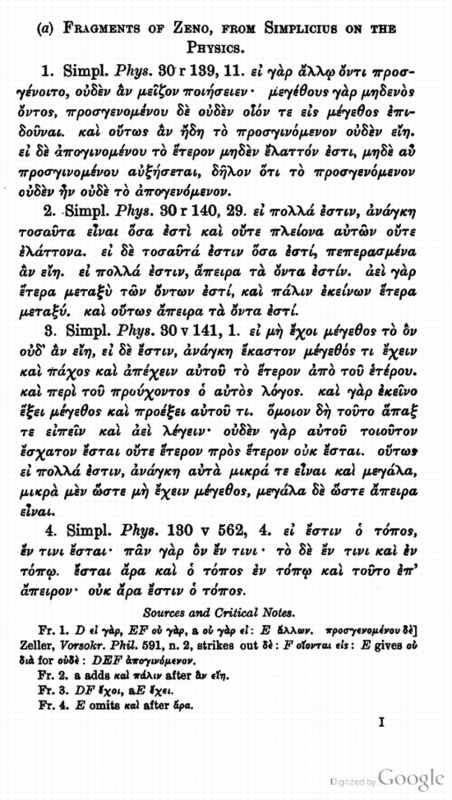 = Simplicii in Aristotelis physicarum libros qua ores edidit H. Diels, Berlin 1882. Simp. Cael. = Simplicius, Commentary on Aristotle's De caelo. Dox. = Diels, Doxographi Graeci, Berlin 1879. Aet. = Aetii de placitis reliquiae. Hipp. Phil. = Hippolyti philosophumena. Epi. = Epiphanii varia excerpta. Herm. = Hermiae irrisio gentilium philosophorum.